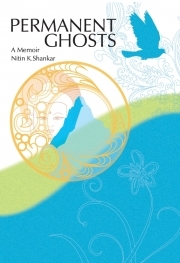 Description of "Permanent Ghosts - A Memoir"
Nitin Shankar is a product of several cultures and his memoir describes his experiences in countries ranging from India and Iran to Germany and Switzerland. While this autobiography describes the people who played an important part in his life, it also captures the atmosphere of towns such as Bombay in forties, Berlin in fifties, Warsaw and Milan in sixties and Tabriz in seventies. Much more than a memoir, Permanent Ghosts is a nostalgic journey into a world that exists only in our memories. Reviews of "Permanent Ghosts - A Memoir"
Nitin Shankar’s autobiography Permanent Ghosts is interesting to me on several fronts. One is historical: India’s independence, partition, the assassination of Mahatma Gandhi, as remembered through events that touched on his child’s world. There is also an account of life in post-war Berlin, and a gripping, in-the-thick-of-it account of Ayatollah Khomeini’s take-over in Iran. The second front is “prototypical” if I may call it that: the forces that shaped Shankar’s life were multicultural, multilingual, global, and (within comfortable levels of the middle and upper classes) seesawed across class and socio-economic boundaries. The author had the adaptability to roll with this, to revel in it even. I call it “prototypical” because Shankar had a head start, by over 50 years, on what many people are only learning to come to terms with today. It’s no longer about small unchanging communities, speaking just one language, guaranteed jobs. What Shankar has known so gracefully how to surf is becoming commonplace and never more so than in the present economic downturn: we move, we travel, we switch jobs, we go up and down on the money ladder, alternating in many cases between working for others and working for ourselves. And like Shankar, we also feel a lot freer about marrying outside our race, nationality or religion, and adopting very personal sets of values and spirituality. He is non-judgmental (this book is entirely free of score-settling and vindictiveness, or didacticism for that matter), never loses his excitement about living, recharges batteries by communing with nature, and is in tune with his senses. He also shows tremendous gratitude. Many of the very qualities that so many coaches and spiritual helpers tell us are necessary to live effectively and well in this new world of ours, Shankar has been doing. That, and communicating. Which brings me to the fourth, and probably the major quality, I like about Permanent Ghosts: Shankar’s respect for others, his lack of snobbism, and his active nurturing of relationships. In short, he’s emotionally intelligent, tuned into his intuition, and has a great gift for relating – communicating effectively – yet with humor, and we never lose sight of his struggles: he’s certainly not making a bid for sainthood. The author heads each of his chapters with a quotation, like the one from American writer Cynthia Ozick from which he takes the book’s title: “What we remember from childhood we remember forever – permanent ghosts, stamped, inked, imprinted, eternally seen.” I certainly don’t disagree, and childhood and other parts of life already lived are certainly ‘ghosts’ insofar as they are of the past. But in examining that past, Nitin Shankar has given us something of value in the here and now, and for the future. Memories -they make our life complete and travel -which a man must in his life! I liked the preview.I wish i could some day gather some courage like you to travel into the unknown! My regards to your parents and friends and all those who gave you such a vision! Once again Congratulations for such a wonderful creation! First, there is the title: Permanent Ghosts, evoking a picture of floating memories teasing the subliminal and brought to life through words. Second, there is the growing recognition that the stories of people, their own personal histories, light up hitherto unknown areas of societies that contribute to our understanding of an era. And last, but certainly not least, people, times and places are bathed in a golden glow of nostalgia, a love and longing for that which we will never see again. Nitin Shankar’s memoir scores on all three bases, bringing to life experiences from a range of countries and times. From pre-Independence Bombay (now Mumbai) to post-war Germany, from Iran caught in the grip of a tumultuous revolution to the calm of Switzerland, Nitin has not only been there, done that, but has also shared with us the special ambience of cities -- Bombay in the ‘40s, Berlin in the ‘50s and Tabriz in the ‘70s. In this shared journey through his life, we are introduced to his family antecedents and the remarkable, you might say, almost improbable, coming together of his parents; to memories of childhood seen through the wide-eyed wonder of a small boy; to a student encountering the atmosphere of an Anglo-Indian school with its unique sub-culture; to a barely-there adolescent setting off on the first big adventure of his life and learning to cope; to professional experiences in a host of countries and economic climates upto and including the notorious “license Raj” days of socialist India. It is a journey that makes for fascinating reading and is recounted in a simple and direct style that is a page-turner. One is carried along on the tides of this surging life; and much, including the descriptions of factories being shut down and offices dismembered, will resonate with readers today. If there is a cavil, it is that some aspects could have been explored a little more fully, and that some people make an appearance all-too-briefly, making the reader question their inclusion in the first place. However, these are subjective views. Always we must respect the author’s selection of what constitute the most vivid details of his life. That they come through to us with such clarity makes the memoir enjoyable and well worth the reading. I thoroughly enjoyed this book. The sections relating to Bombay were especially nostalgic, as I virtually grew up in the city. The Eros, The Regal, Cuffe Parade, Marine Drive and Church Gate were so familiar, as were the restaurants and hotels mentioned. The train journey to Santa Cruz and then the bus to Juhu bring back such happy memories. I remember that the bus terminus at Juhu was nothing more than a bus stop with a few food vendors, one or two holiday type restaurants and perhaps no more than half a dozen buildings. Though I have never been back to India since I left in the Spring of 1953, I am told by those who have returned on holiday, that Juhu now rivals many cities in size and population. Other places mentioned such as Malta, Cyprus and others round the world bring memories flooding back - good and bad. The one that made me smile was the trip on the Star of Malta from Valetta to Syracuse, a trip I did when I returned from my posting to the former Island. I have vivid recollections of my car being swung on and off the ship each end of the journey by a rickety derrick-type contraption and coir ropes! Nitin Shankar's memoirs of a remarkably varied life might just as easily be entitled 'In the Right Place at the Right Time' or 'In the Wrong Place at the Wrong Time'. As for the former, he regales of with tales of the halcyon days of Bombay (as opposed to its current incarnation as moloch Mumbai) in the 1940s and 50s. From there he moves on to the unique atmosphere of divided Berlin before and after the Wall went up. The 'wrong place'? Iran on the cusp of revolution. These are just three places where Shankar has, as it were, pitched his tent; one could add the dizzying mix of Warsaw, Aden, Dehli, French-speaking Switzerland and Rhode Island. Whether fondly recalling family gatherings as a child in India, forced to eat stomach-churning offal in impoverished Berlin in the 1950s, cutting deals in the USA and Switzerland or hot-footing it out of an increasingly violent Iran, Shankar never loses his eye for detail. This meticulously drawn memoir of 70 years of work, travel and pleasure (not always in that order) makes compelling reading, as Shankar again and again finds himself in places and moments of great historical interest.